Not too long ago, we moved our office to The Miracle Mile in San Anselmo. The new space works well for us, and it wasn’t a huge transition since the setups are similar and we only moved about a mile down the road. But the experience got us wondering about more dramatic leaps workplaces are making these days, so we did a little digging. 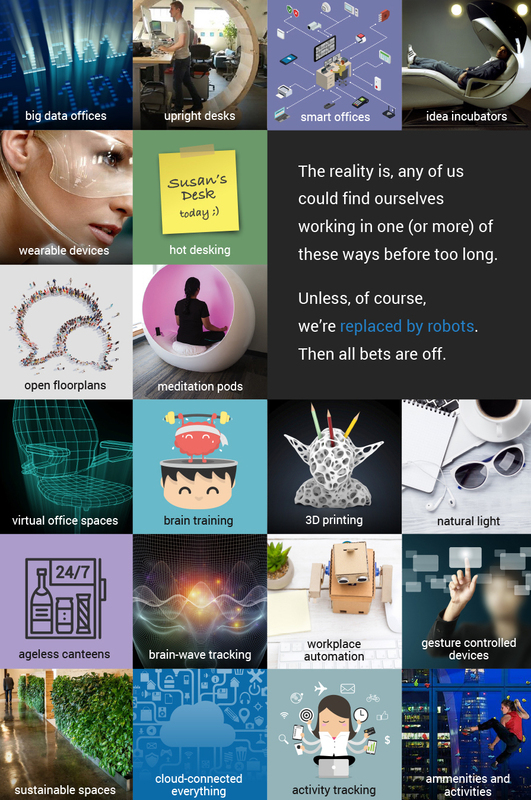 Here are a bunch of technologies some companies are trying, plus a few tried and true ideas and a couple that are still pipe dreams. It’s weird and wonderful stuff that certainly has us excited. That said, Facebook’s new building that will soon put several thousand employees in a single mile-long room is a bit confounding. But hey, whatever works to help you work. Right?